When you stay at South Point Hotel, Casino, and Spa in Las Vegas, you'll be near the airport, within a 10-minute drive of T-Mobile Arena and Town Square Las Vegas. 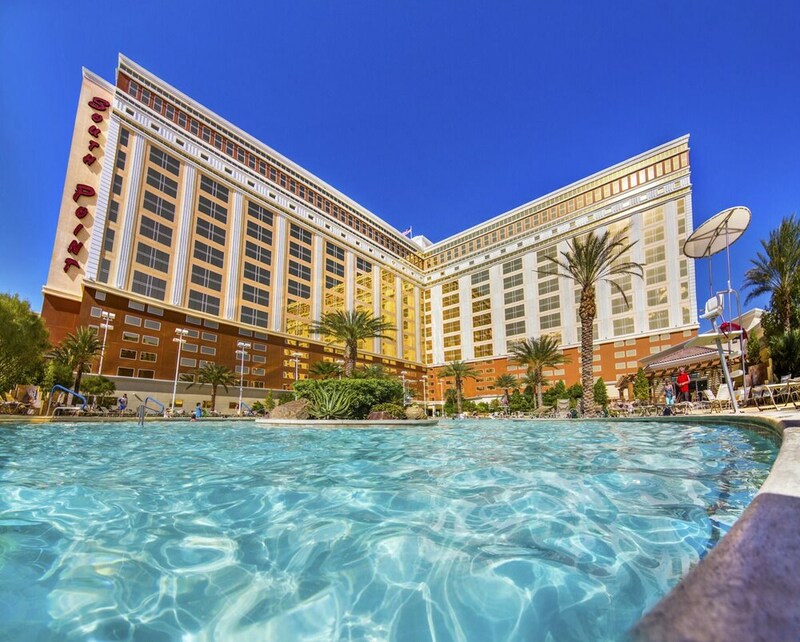 This 4-star resort is 7.1 mi (11.4 km) from MGM Grand Casino and 7.2 mi (11.5 km) from Park Theater. Located on the south end of Las Vegas Boulevard, the 25-story South Point Hotel, Casino, and Spa is 9 miles from the Las Vegas Convention Center and 11 miles from downtown. Spa services include massage, a hair salon and beauty services, facial treatments, and body treatments. Dining options include a fine-dining steakhouse, a buffet restaurant, a 24-hour American and Chinese café, a deli, and Italian, Mexican, and seafood restaurants. Room service is available 24 hours. A pool complex features a large outdoor pool, spa tub, and poolside bar. In addition to the on-site casino, guests enjoy a movie theater, bowling alley, health spa, and equestrian center; surcharges may apply. The resort's 150,000 square feet of meeting and event space includes a column-free exhibit hall and a grand ballroom for 2,000 guests. A 24-hour, self-service business center provides copying, faxing, printing, and shipping (surcharges may apply). Complimentary airport transportation is available during scheduled times (advance reservations required). Self and valet parking are complimentary. Silverado Steakhouse - This fine-dining restaurant specializes in steak and seafood for dinner only. Don Vito's - This fine-dining Italian and seafood restaurant is open for dinner only. Michael's Gourmet Restaurant - This intimate restaurant has just 50 seats. Big Sur Oyster Bar - Seafood selections include a raw bar. It is open from late morning until late night. Coronado Café - This casual 24-hour restaurant has American and Chinese menus. Primarily Prime Rib - Catering to hearty appetites, this restaurant features 4 prime rib cuts, dry aged and slowly roasted. Baja Miguel's Mexican - This restaurant serves Mexican favorites and drinks such as margaritas. Garden Buffet - This restaurant offers breakfast, Sunday brunch, lunch, and dinner buffets, including Monday steak night and Friday seafood night. Del Mar Deli - The deli is open from early morning until late evening. Kate's Korner - This spot serves ice cream and other treats from late morning until late night. Seattle's Best Coffee - Coffee and pastries are available from early morning until late night. Del Mar Lounge - Open from late afternoon until late evening, this bar features dueling pianos on select evenings. Poolside Bar - Cocktails and other beverages are served poolside from early morning until late evening. Steak N Shake - A classic American brand known for the original Steakburger and hand-dipped milkshakes. Zenshin - An enhanced menu featuring contemporary pan-Asian cuisine. The 80,000-square-foot casino includes 2,200 slot and video poker machines, 60 table games, a poker room, a race and sports book, and bingo. The hotel's equestrian center offers a year-round schedule of events (surcharges may apply). A 16-screen movie theater (surcharge) is on site. A 24-hour, 64-lane bowling alley (surcharge) includes a 24-hour bar and a snack bar open from early morning until late night. A pool complex includes a 164-foot-long freeform outdoor pool and a spa tub measuring 50 x 50 feet with a rock-garden waterfall at the center. The resort's Costa Del Sur Spa and Salon (surcharge) provides a variety of beauty and body treatments, a steam room, spa tub, cold bath, couples area, and a fitness center with cardio and strength-training equipment. The South Seas-themed Bali Hai Golf Club is 5.5 miles away, and the 18-hole courses at Desert Pines Golf Club and Royal Links Golf Club are both within 17 miles. Red Rock Canyon National Conservation Area, 21 miles away, provides rock climbing, biking and hiking trails, and scenic drives. Mount Charleston, 49 miles away, has biking and hiking trails, horseback riding, skiing, and snowboarding. This property offers airport shuttle pickup service from McCarran Airport, Level 0, Terminal 1 only. For more details, please contact the property using the information on the reservation confirmation after booking.